In 2009, Carl Edwards‘ No. 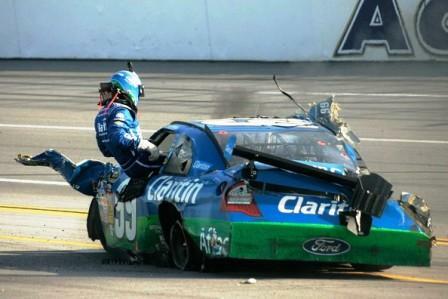 99 car caused major damage during the Aaron’s 499 at Talladega Superspeedway. While trying to block Brad Keselowski from passing him, Edwards’ vehicle went airborne and slammed into the catch fence on the frontstretch. Despite how bad the crash looked, fortunately, no one was seriously injured in the incident.